Your little stinker sure does not stink! Mmmm, quite fresh smelling, actually. I don’t think I’ve ever seen one in real life before. Ooooh, what a festive and fantastic banner! Hi Krista, oh we have them here too, they have crosses on their back and they reputedly spray you in the eye and you go blind. So one never looks directly at them – they are the medusa’s of beetles. oh, by the way, do you ever hear anything from Susan? hmmm, I’d rather have the lady bugs me thinks, which I do, rampantly! I’m also enduring the invasion of the fruit flies which followed the invasion of bazillions of tiny black sugar ants. I’m so glad I don’t have these critters too! The other thing is… since the stinkbugs moved in, the annual indoor refuge of the ladybugs is over– so I say– Can’t we all just get along? HA! We (along with 28 other states, apparently!) are being invaded by these little cuties. I never experienced their stinkiness until we got a cat who spends her day hunting them down and pouncing on them. They don’t have a whew-knock-your-socks-off-skunk-or-mushroom-farm kind of stink, but they do have a hmmm-that’s-really-kind-of-yukky-cat-you-need-to-stop-that smell. and what made you want to draw a stink bug Krista? 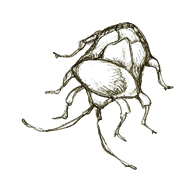 nice drawing, do stink bugs really stink? I just keep really loving your fall header, sooooo cute! This sketch is done from an interesting angle. and I love the title!